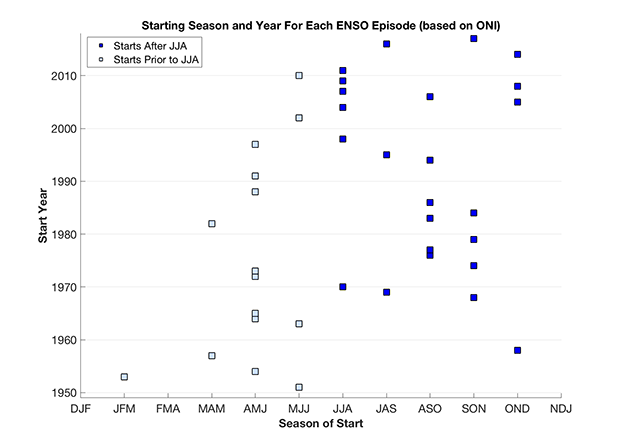 What’s happening in the exciting world of ENSO prediction? I’ll tell you! While neutral conditions reign right now, we’re still expecting El Niño conditions to arrive later this fall (50-55% chance). By winter, the chance of El Niño conditions increases to about 65-70%. The atmosphere is also rolling along in neutral, with the last vestiges of the La Niña-ish cloud/rain pattern in the tropical Pacific dissipating over the past couple of months. 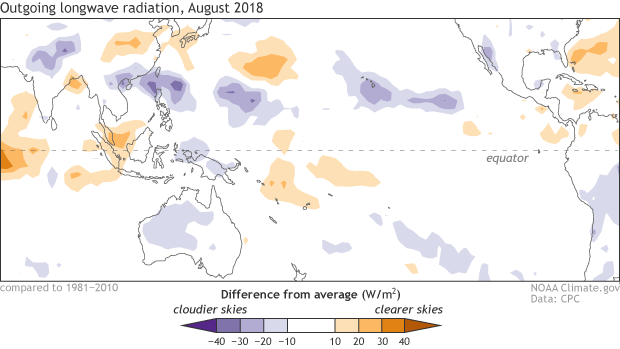 During August, most of the tropical Pacific featured near-average cloudiness. Places that were more (purple) or less (orange) cloudy than the 1981-2010 average during August 2018, based on satellite observations of outgoing longwave radiation (heat). Thick clouds block heat from radiating out to space, so less radiation equals more clouds, and more radiation equals clearer skies. Climate.gov map from CPC OLR data. Most climate models are predicting that sea surface temperatures will cross the El Niño threshold (0.5°C above the long-term mean) by the fall. This warming is one major factor in the forecast for a 50-55% chance that El Niño conditions will develop in the next few months. There are several physical factors that bolster the model forecasts, too. For one, the equatorial Pacific subsurface heat content, which measures the amount of extra warmth in the Pacific Ocean waters between the surface and depths of about 1000 feet, is still elevated. A downwelling Kelvin wave—a large blob of warm water that gradually sloshes eastward under the surface of the equatorial Pacific—was reinforced by some changes in the winds above the tropical Pacific in early August. As this Kelvin wave moves eastward, the warmer waters will rise, providing a source of warmer water for the surface over the months to come. Wait, what? Westerly winds? Wow! We watch the winds in the tropical Pacific closely, because they’re a critical component of ENSO. On average, these winds (the trade winds) blow steadily from the east to the west along the equator, cooling the surface of the eastern Pacific and pushing warm water toward the west. When the wind pattern changes, the ocean can change. The language around winds is one of the more confusing things in meteorology and climatology. Since the trade winds normally blow from the east, they’re called easterly winds. When the easterlies slow down, we call that change a westerly anomaly. If the anomalies are strong, sometimes they’re called a “westerly wind event” or “westerly wind burst.” Rarely do the trade winds actually reverse direction—that usually only happens during a strong El Niño like 1997–98 or 2015-16. But just weakening is enough to change the circulation in the ocean. Over the past few months, we’ve seen some westerly wind anomalies, including the one in early August that reinforced the downwelling Kelvin wave. Nothing exceptionally powerful in the winds, but enough to provide some confidence to the forecast that El Niño conditions are on the way. 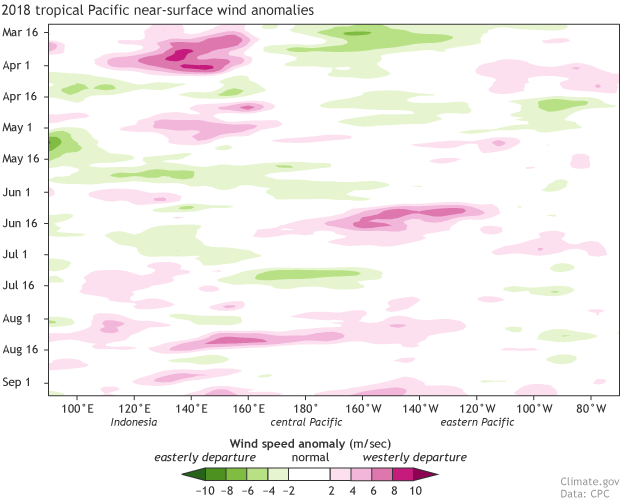 Near-surface wind anomalies over the tropical Pacific (5°N-5°S) during 2018, starting at the top in March and ending in early September at the bottom. Each row in this type of image is the departure from average (1981-2010) at that time. NOAA Climate.gov image, based on data provided by the Climate Prediction Center. Last month, a reader asked if hurricanes in the tropical Pacific such as Hector could cause changes in the trade winds. It’s an excellent question—the winds on the south side of a northern hemisphere tropical storm like Hector do blow pretty powerfully from west to east. (They are rounding the eye of the storm along a counter-clockwise arc.) This is something scientists have been studying almost as long as we’ve been studying El Niño! Like most things involving the Earth system, it’s complicated, and not always clear what’s the tail and what’s the dog. Very simply, if a storm is close enough to the equator, its winds may influence the trade winds and create a westerly wind anomaly. As far as Hector goes: you can see from this National Hurricane Center animation that the tropical wind field did not extend below about 12° north of the equator, probably not far enough south. Some weak westerly wind anomalies were observed during early August in the region of 140°W longitude, though! Were they related to Hector? Or were they caused by something else, and may have influenced Hector? (Oh yeah, westerly wind anomalies can affect tropical storms, too.) This requires more study! Four years ago, we were looking at a 55% chance of El Niño conditions developing during September­–November, with a 65% chance they’d develop by winter. That sounds familiar! Back then, Michelle did some analysis regarding the onset time of El Niño conditions that is worth revisiting. An updated plot using the latest ERSSTv5 data finds that in recent decades, El Niño onset has tended to be in the second half of the year. Start time for each El Niño or La Niña event since 1950. Figure by CPC from historical ONI index data. ENSO, of course, is a coupled system. The expectation is that when the sea surface temperatures in the central and eastern Pacific warm above the El Niño threshold, there will be increased rising air and cloudiness in the central Pacific, which changes the entire atmospheric circulation over the tropical Pacific, weakening the Walker circulation. In 2014, the surface did warm, mostly hovering right around the El Niño threshold of 0.5°C above average through the winter. But, the El Niño atmospheric response didn’t kick in until the following spring, at the start of the mammoth 2015-16 event. That kind of borderline situation happening again isn’t impossible, but we think it’s less likely this time. In August 2014, convection over the western Pacific and Date Line looked more like La Niña (suppressed) than a developing El Niño. The fact that we presently do not have a La Niña-like convection pattern is one promising sign, among the many outlined above. Thus, our current forecast continues to favor the formation of El Niño conditions this fall. What are the chances we experience a modoki el nino this year? Thanks! Hurricane Florence is a recent example of hurricanes striking the U.S. during or just before El Niño. Other past hurricanes include Hurricanes Charley, Frances, Ivan and Jeanne, which struck the U.S. just before the 2004-2005 El Niño set in. Hurricanes Isidore and Lili hit the Southern U.S. in the early part of the 2002-2003 El Niño. Hurricanes Bob and Andrew hit the United States during the 1990-1993 El Niño. Andrew was especially devastating in the Southern United States. Hurricanes David and Frederic struck the Southeast and Southern United States respectively just prior to the 1979-80 El Niño. Hurricane Belle struck from North Carolina to New England just before the 1976-77 El Niño set in. There was also Hurricane Camille in August 1969 which devastated the Southeastern United States during the 1968-1970 El Niño. There will be more such hurricanes that devastate or strike the Northeast, Southeast or Southern United States during or just before El Niño. Great article, written with wit and enthusiasm. On the "Starting Season" graph, it's hard to read which year each of the dots indicates--one can only guess. Perhaps faint horizontal lines in the graph might help? Thanks for the suggestion! I'll take it to our graphics team. Thank you for all the work you do on this blog, I love it and I'm learning a lot! I was wondering, does the average on which forecasters base the possibility of an ENSO even change over time? So if the oceans are gradually warming, will the enso signal have the same .05C departure because the average is increasing? Or will we just be seeing El Nino after El Nino and fewer La Nina events? Your question makes perfect sense! For ENSO prediction, we update the period that defines "average" every five years, so the +0.5C is relative to the most recent 30-year period, currently 1986-2015. There's more information here. Thanks for reading, Grandpa Garry! Hello! The effects of ENSO in northern Europe tend to be less consistent than in other parts of the world. You can check out our maps showing the ENSO teleconnections here; as you'll notice, El Nino winters tend to be a bit cooler and drier than average in Sweden, but the correlation is not strong, meaning this isn't a particularly consistent effect. The UK Met Office has some information on European ENSO teleconnections, here. 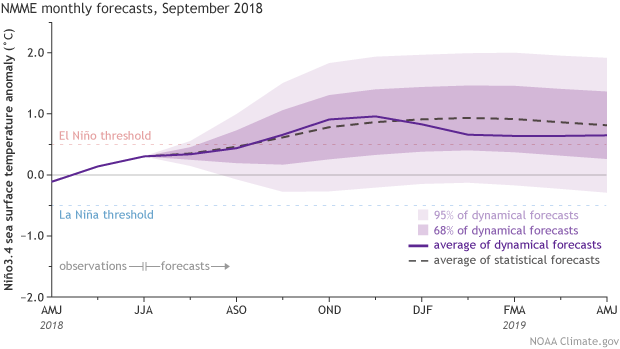 Interestingly, their analysis has found that weaker El Nino events are related to cooler winters over Northern Europe, but strong El Nino events have the opposite effect. So... maybe you can plan to build a few more snowmen this winter, given the likelihood of a weak El Nino? Stuck on the Queensland coast in the rain - so l had a look at the Oz Met forecast site and yours - both of which I like - in order to see what is happening near the Equator. The Oz forecast shows some 30C water developing towards the dateline, yours shows warm anomalies developing even further east north of the Equator. As 30C is enough for a lot of deep atmospheric convection why doesn't the NOAA site also show absolute values. (21C water warming by 6C is unlikely to be as important as 28C water increasing by 2C). Some plots of regions of deep atmospheric convection or equivalent rainfall would also be useful. On a second point you mention warm water moving east along the Equator. I know this may be contentious but I suspect that this usually happens after the normal trade wind has dropped because the near surface current on the Equator is dominated by the wind. If this is correct something causes the trades to drop and this in turn causes the reversed current on the Equator - not the other way around as is normally implied.